There’s no denying that vast fields of contiguous, homogenous plantings are efficient. Large tracts lend themselves to 100 foot drills, 150 foot spray booms, Class 10 combines and 600 horsepower tractors. They are also ideal for aerial spraying. Long, large fields of identical crops are the perfect target for spray planes putting down pesticides, and the industry will continue to see more spray planes in the sky as average field sizes increase. With the largest of the new generation spray planes carrying as much liquid as a mid-sized high clearance sprayer, farmers are discovering that aircraft can offer better productivity than a ground rig. Most producers aren’t likely to pay $1.5 million for a new 800 gallon, 200 m.p.h. Air Tractor 802, but more of them are investing in their own spray planes, says Gary Moffat of Specialized Spraying Systems in Lethbridge. Moffat said a large number of acres and a small number of hours means many farmers feel they have no option but to take to the skies with their spraying operations. Weather decides whether farmers can go spraying, either with a ground rig or an airplane. However, if the weather co-operates, an airplane can put 500 gallons of product on target in the time it takes a high clearance operator to set up the GPS. However, big, single crop blocks are also infamous for inviting infestations of disease, weeds and in-sects, said Tim Sander of Micronair, a British company that designs and builds rotary atomizer nozzles for aircraft. “Not only is the airplane more productive than a ground rig, it also lets you get onto the field right after a rain if need be,” he said. Sander said an aircraft won’t transmit disease, weed seeds or insects from one field to the next. “So now, when you do get an outbreak of weeds or disease or insects, the situation spreads very quickly,” he said. Spray drift is another factor in aerial application, and Sander said it may ultimately be a bigger issue than air speed or liquid capacity. Governments and the public are watching the spray business with a sharp focus on drift issues. “To be productive, the operator doesn’t want to be applying enormous volumes of liquid, hence technologies such as controlled droplets and atomizers for efficient application at a lower water rate,” said Sander. “When it comes to liquid volume, there are limits to how low you can go. If you reduce your volume too much, and subsequently reduce your droplet size to maintain coverage, then of course you eventually end up releasing small droplets. Despite the inherent drift risk, Sander expects the liquid capacity of spray planes to continue growing. And as producers run their cost benefit analysis comparing aircraft to ground sprayers, he expects the number of aircraft to also increase. “Spray planes have always been built to fit the situation, fit the fields. They used to be smaller, lighter and more nimble to fit the smaller fields we used to farm. As we move toward larger and larger fields, we’ll see larger aircraft with higher speeds and bigger capacity,” he said. Better reliability with less maintenance and lower operating costs is the other trend that’s become the industry norm and will certainly continue to expand. 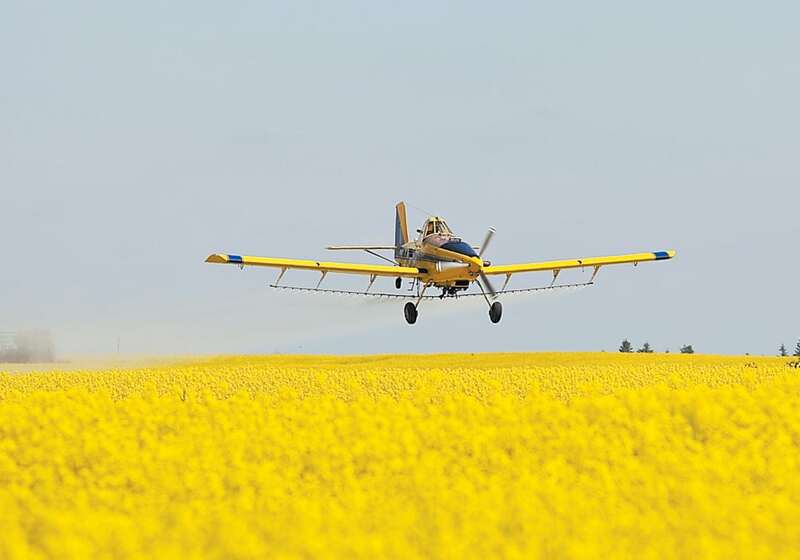 This factor will encourage operators to keep upgrading to the latest planes, which in turn will put more used spray planes on the market for farmers to buy. Sander said speculation about crop protection chemicals developed specifically for aerial application is unfounded. The only thing the crop cares about is the amount of active ingredient applied to the right part of the plant in a timely manner. The crop doesn’t care if it’s applied by high clearance sprayer, air plane or backpack sprayer. “If we look at places like South America where low volumes are common, products are formulated with anti-evaporant or it’s added during application. It’s not a fundamentally different active ingredient, just a different way of manufacturing it and applying it,” he said. He said oil adjuvants are being used as an anti-evaporant to prevent small droplets from evaporating, which also acts as a sticker on foliage to improve rain fastness. “The extra cost is more than offset by better product efficacy,” he said. For more information, contact Sander at tsanders@micronair.co.uk.